Blaser Swisslube and Butler Bros. will co-host event featuring technical seminars, machining demonstrations and more. WEST BOYLSTON, MA U.S.A. (July 31, 2017) – Emuge Corp. (www.emuge.com) announced today they are holding an informative, complimentary Joint-Open House Event together with Blaser Swisslube and Butler Bros. on September 14th, 2017. The event will take place at the Emuge North American corporate headquarters and new, state-of-the-art Technology Center located at 1800 Century Drive in West Boylston, MA. 10:00 am to 2:00 pm. A series of technical seminars and machine demonstrations will be featured in addition to tours of the Emuge facility. Technical seminars will feature a Liquid Tool Analyzer from Blaser Swisslube designed to increase productivity and decrease manufacturing costs. Industrial distributor Butler Bros., a supplier of a broad range of high quality products including machines, cutting tools and MRO products will also showcase their Partnership Program that helps streamline facilities purchasing. Machining demonstrations will showcase new tools and the latest Emuge cutting tool technologies including circle segment 5-axis milling, trochoidal milling, drilling, thread milling, tapping and more. 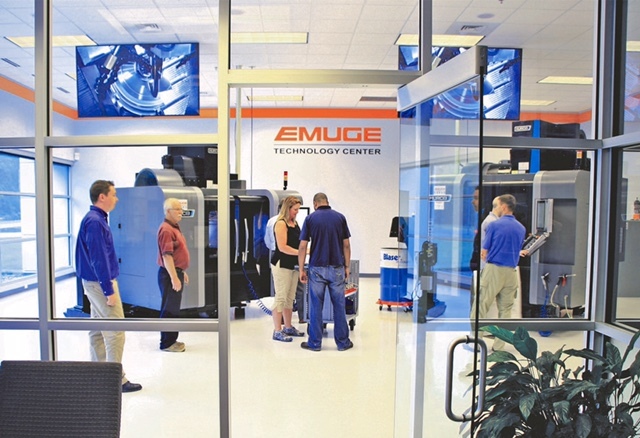 The demonstrations will take place in Emuge's new full-service Technology Center which is equipped with the latest 3 and 5-axis vertical machining centers, precision measuring devices and tool monitoring, in addition to an interactive classroom for training and seminars. “Our Joint-Open House is a great opportunity for manufacturing professionals to see the latest cutting technologies and learn how our new Technology Center capabilities can help their operations,” said Bob Hellinger, President of Emuge Corp. Door prizes and raffles will be offered, and food and refreshments will also be served. Register here. Emuge Corp. is a wholly owned subsidiary of the 1,500+ employee, German company, EMUGE-Werk Richard Glimpel GmbH & Co. KG (Lauf, Germany) that has been the product technology and performance leader in their field for over 90 years. The company manufactures an extensive line of taps, thread mills, drills, end mills, toolholders, clamping devices and other rotary cutting tools, over 30,000 items sold through distributors worldwide. Emuge also offers end-user technical support through a network of in-the-field engineers and in-house product specialists, all with extensive tooling and application experience. Over 10,000 types of cutting tools and accessories are stocked in the company’s U.S. and Canadian Headquarters located in West Boylston, MA, U.S.A. The 21,000 square foot state-of-the-art facility includes the technology center with a machining and tooling demonstration showroom and classroom, tool warehouse, sales, support and administrative offices. For more information on Emuge products, contact Emuge at 1800 Century Drive, West Boylston, MA 01583-2121, Tel. 800-323-3013, internet: www.emuge.com.